Council Directive 93/92/EEC of 29 October 1993 on the installation of lighting and light-signalling devices on two or three-wheel motor vehicles (3) has been substantially amended (4). In the interests of clarity and rationality the said Directive should be codified. Directive 93/92/EEC is one of the separate Directives of the EC type-approval system provided for in Council Directive 92/61/EEC of 30 June 1992 relating to the type-approval of two or three-wheel motor vehicles as replaced by Directive 2002/24/EC of the European Parliament and of the Council of 18 March 2002 relating to the type-approval of two or three-wheel motor vehicles (5), and lays down technical prescriptions concerning the design and construction of two or three-wheel motor vehicles as regards the installation of lighting and light-signalling devices. Those technical prescriptions concern the approximation of the laws of the Member States to allow for the EC type-approval procedure provided for by Directive 2002/24/EC to be applied in respect of each type of vehicle. Consequently, the provisions laid down in Directive 2002/24/EC relating to two or three-wheel motor vehicle systems, components and separate technical units apply to this Directive. In each Member State the lighting and light-signalling devices fitted to two or three-wheel vehicles should display certain technical characteristics laid down by mandatory provisions. It is necessary to draw up harmonised requirements concerning the fitting of those devices in order to enable the EC type-approval procedure laid down in Directive 2002/24/EC to be applied for each such vehicle. It should be specified that lighting devices type-approved for vehicles in categories M1 and N1, in accordance with the relevant Directives, may also be installed on two or three-wheel motor vehicles. Provision should also be made to permit the optional installation of front fog lamps, rear fog lamps, reversing lamps and hazard warning devices on three-wheel mopeds and light quadricycles. In order to facilitate access to the markets of non-Community countries, an equivalence should exist, as far as two-wheel motorcycles are concerned, between the requirements of this Directive and those of Regulation No 53 of the United Nations Economic Commission for Europe (6) (UNECE). This Directive applies to the installation of lighting and light-signalling devices on all types of vehicle as referred to in Article 1 of Directive 2002/24/EC. The procedure governing the granting of EC component type-approval in respect of the installation of lighting and light-signalling devices on a type of two or three-wheel motor vehicle and the conditions governing the free movement of such vehicles shall be as laid down in Directive 2002/24/EC. 1. In accordance with Article 11 of Directive 2002/24/EC, equivalence between the requirements laid down in this Directive for two-wheel motorcycles and those laid down in UNECE Regulation No 53 is hereby acknowledged. 2. The authorities of the Member States which grant EC component type-approval shall accept approvals granted in accordance with the requirements of UNECE Regulation No 53 as well as component type-approval marks as an alternative to the corresponding approvals granted in accordance with the requirements of this Directive. The amendments necessary to adapt to technical progress the requirements of Annexes I to VI shall be adopted in accordance with the procedure referred to in Article 18(2) of Directive 2002/24/EC. if the installation of lighting and light-signalling devices complies with the requirements of this Directive. 2. Member States shall refuse to grant EC type-approval for any new type of two or three-wheel motor vehicle on grounds relating to the installation of lighting and light-signalling devices if the requirements of this Directive are not fulfilled. Directive 93/92/EEC, as amended by the Directive listed in Annex VII, Part A, is repealed, without prejudice to the obligations of the Member States relating to the time limits for transposition into national law and application of the Directives set out in Annex VII, Part B. (3) OJ L 311, 14.12.1993, p. 1.
means a device or part of a device, having one function and one illuminating surface and one or more light sources. For the purpose of installation on a vehicle, a ‘single lamp’ also means any assembly of two independent or grouped lamps, whether identical or not, having the same function, if they are installed such that the projections of the illuminating surfaces of the lamps on a given transverse plane occupy not less than 60 % of the smallest rectangle circumscribing the projections of the said illuminating surfaces. means the angles which determine the field of the minimum solid angle in which the apparent surface of the lamp must be visible. That field is determined by the segments of the sphere of which the centre coincides with the centre of reference of the lamp and the equator is parallel with the ground. These segments are determined in relation to the axis of reference. The horizontal angles β correspond to the longitude and the vertical angles α to the latitude. There must be no obstacle on the inside of the angles of geometric visibility to the propagation of light from any part of the apparent surface of the lamp observed from infinity. If measurements are taken closer to the lamp, there must be a parallel shift in the direction of observation to achieve the same accuracy. No account is taken of obstacles on the inside of the angles of geometric visibility, if they were already present when the lamp was type-approved. means a telltale showing that a device has been switched on but not showing whether it is operating correctly or not. 1. The lighting and light-signalling devices must be so installed that, under normal conditions of use and notwithstanding any vibration to which they may be subjected, they retain the characteristics laid down and enable the vehicle to comply with the requirements of this Directive. In particular, it must not be possible for the adjustment of the lamps to be inadvertently disturbed. 2. The illuminating lamps must be so fitted that their alignment can easily be set correctly. 3. For all light-signalling devices the reference axis of the lamp when fitted to the vehicle must be perpendicular to the median longitudinal plane of the vehicle in the case of side retro-reflectors and parallel to that plane in the case of all other signalling devices. In each direction a tolerance of 3° is allowed. In addition, any specific instructions as regards fitting laid down by the manufacturer must be complied with. 4. The height and alignment of lamps are checked, in the absence of specific instructions, with the vehicle unladen and located on a flat horizontal surface, with its median longitudinal plane being vertical and its handlebars or steering wheel in the dead-ahead position. The tyre pressure must be that specified by the manufacturer for the specific loading conditions laid down. 5.4. have substantially identical photometric characteristics. 6. In the absence of specific instructions, lamps having different functions may be independent or be grouped, combined or reciprocally incorporated in one device, provided that each such lamp complies with the requirement applicable to it. 7. The maximum height above ground is measured from the highest point, and the minimum height from the lowest point, of the illuminating surface. The minimum height above ground of dipped-beam headlamps must be measured from the lower edge of the lens, or of the reflector if the latter is higher. 8. In the absence of specific requirements no lamps other than direction indicator lamps and the hazard warning signal may emit a flashing light. 9.3.2. as regards width, by two vertical planes making an angle of 15° towards the front and rear respectively, and outside the vehicle by reference to the median longitudinal plane of the vehicle. These planes contain, respectively, the vertical lines of intersection of the vertical planes parallel to the longitudinal median plane of the vehicle and representing its overall width, and of the transverse planes representing the overall length of the vehicle. 10. The electrical connections must be such that the front position lamp or the dipped-beam headlamp, if there is no front position lamp, the rear position lamp and the rear registration-plate lamp can only be switched on and off simultaneously. 11. In the absence of specific requirements, the electrical connections must be such that the main-beam headlamp, the dipped-beam headlamp and the fog lamp cannot be switched on until the lamps referred to in point 10 have also been switched on. This requirement does not apply, however, to main-beam or dipped-beam headlamps when their optical warnings consist of the intermittent lighting-up at short intervals of the main-beam headlamp, or the intermittent lighting-up at short intervals of the dipped-beam headlamp, or the alternate lighting-up at short intervals of the main-beam and dipped-beam headlamps. 12.1. All telltales must be clearly visible to the driver in the normal driving position. 12.2. Where provision has been made for a circuit-closed telltale it may be replaced by an operational telltale. The definition of lamp colours must be as laid down in Appendix 2. 14. All lighting and light-signalling devices must be component type-approved. However, pending the entry into force of harmonised provisions concerning lighting and light-signalling devices on mopeds with engines of no more than 0,5 kW and a maximum speed not exceeding 25 km/h, such mopeds may be fitted with dipped-beam headlamps and/or rear position lamps which have not been approved. In such cases, the manufacturer must declare that the devices concerned conform to ISO standard 6742/1. Specific additional requirements will be laid down in accordance with the procedure referred to in Article 18(2) of Directive 2002/24/EC. NB: Notwithstanding the drawing the apparent surface is to be considered as tangent to the light-emitting surface. 1.6. pedal retro-reflectors only where two-wheel mopeds are fitted with non-retractable pedals. 3. Each of the lighting and light-signalling devices referred to in points 1 and 2 must be fitted to comply with the appropriate provisions of point 6. 4. No lighting and light-signalling device other than those referred to in points 1 and 2 may be fitted. 5. The lighting and light-signalling devices referred to in points 1 and 2 and type-approved for motorcycles, in accordance with Directive 97/24/EC, or type-approved for vehicles in categories M1 and N1, in accordance with Directives 76/757/EEC, 76/758/EEC, 76/759/EEC, 76/760/EEC, 76/761/EEC, 76/762/EEC, 77/538/EEC or 77/539/EEC, shall also be permitted on mopeds. 6.1.1. Number: one or two. 6.1.2. Arrangement drawing: no individual specifications. 6.1.3.2. The length: at the front of the vehicle. This requirement is considered to have been met if the light emitted does not disturb the driver either directly or indirectly by means of the rear-view mirrors and/or reflective surfaces on the vehicle. 6.1.3.3. In any case, the distance between the edge of the illuminating surface of any independent main-beam headlamp and the edge of that of the dipped-beam headlamp must not exceed 200 mm. 6.1.3.4. The distance separating the illuminating surfaces of two main-beam headlamps must not exceed 200 mm. Even in the zones which do not seem to be illuminated in the direction of observation under consideration, the illuminating surface must be visible within a divergent area limited by generatrices touching the entire contour of the illuminating surface and forming an angle of 5° at least with the headlamp reference axis. The contour of the projection of the illuminating surface on to a transverse plane that is tangent to the front part of the main-beam headlamp lens is considered to be the origin of the angles of geometrical visibility. 6.1.5. Alignment: towards the front. May pivot along with the steering angle. 6.1.6. May be grouped together with the dipped-beam headlamp and the front position lamp. 6.1.7. May not be combined with any other lamp. 6.1.8.2. with the front position lamp. The main-beam headlamps must light simultaneously. All main-beam headlamps must light when they are switched from dipped-beam to main-beam. All main-beam headlamps must be extinguished simultaneously when switched from main-beam to dipped-beam. The dipped-beam headlamps may remain lit at the same time as the main-beam headlamps. 6.2.1. Number: one or two. 6.2.2. Arrangement drawing: no individual specifications. 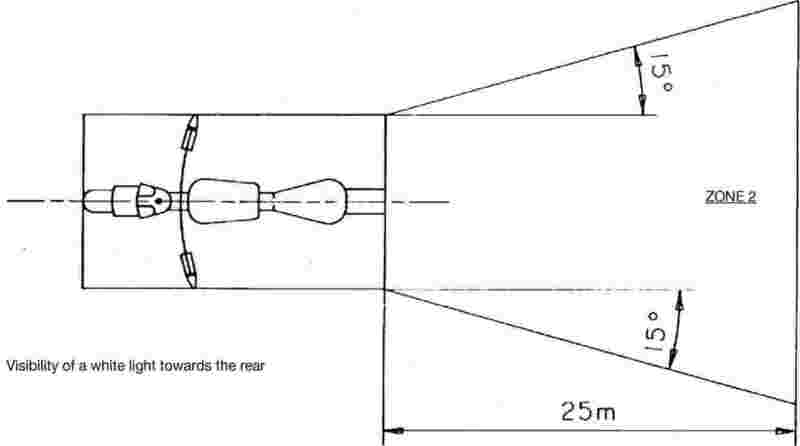 two dipped-beam headlamps, of which either one or both are reciprocally incorporated with another front lamp must be installed in such a way that their reference centres are symmetrical in relation to the median longitudinal plane of the vehicle. 6.2.3.2. Height: a minimum of 500 mm and a maximum of 1 200 mm above the ground. 6.2.3.3. Length: at the front of the vehicle this requirement is regarded as satisfied if the light emitted does not cause discomfort to the driver either directly or indirectly by means of the rear-view mirrors and/or other reflecting surfaces of the vehicle. 6.2.3.4. In the case of two dipped-beam headlamps the distance separating the illuminating surfaces must not exceed 200 mm. 45° outwards and 10° inwards if there are two dipped-beam headlamps. The presence of panels or other items of equipment near the light must not give rise to secondary effects causing discomfort to other road users. 6.2.5. Alignment: towards the front. May move in line with the steering angle. 6.2.6. May be grouped together with the main-beam headlamp and the front position lamp. 6.2.7. May not be combined with any other lamps. 6.2.8. May be reciprocally incorporated with the main-beam headlamp and the front position lamp. The control for changing over the dipped beam must switch off all main-beam headlamps simultaneously, whereas the dipped beams may remain switched on at the same time as the main beam. 6.3.1. Number: Two per side. 6.3.2. Arrangement drawing: two front and two rear indicator lamps. 6.3.3.1.1.2. they must be situated outside the vertical longitudinal planes that are tangent to the outer edges of the illuminating surfaces of the headlamp(s). 6.3.3.1.2. The distance between the inner edges of the illuminating surfaces of the rear indicator lamps must be at least 180 mm. 6.3.3.2. Height: minimum 350 mm, maximum 1 200 mm above the ground. 6.3.3.3. Length: the distance towards the front between the transverse plane corresponding to the extreme longitudinal rearmost extremity of the vehicle and the centre of reference of the rear indicators must not exceed 300 mm. Horizontal angles: see Appendix 2. However, the vertical angle below the horizontal may be reduced to 5° if the lamps are less than 750 mm above the ground. The front direction indicator lamps may move in line with the steering angle. 6.3.6. May be grouped with one or more lamps. 6.3.7. May not be combined with any other lamp. 6.3.8. May not be reciprocally incorporated with another lamp. Direction indicator lamps must switch on independently of the other lamps. All direction indicator lamps on one side of a vehicle must be switched on and off by means of one control. It may be optical or auditory or both. If it is optical it must be a green flashing light and visible under all normal operating conditions. It must be extinguished or remain alight without flashing or show a marked change of frequency in the event of the malfunction of any of the direction indicator lamps. If it is entirely auditory it must be clearly audible and show the same operating conditions as the optical telltale. The characteristics listed below must be measured with the electrical generator supplying current only to those circuits that are essential to the operation of the engine and lighting devices. 6.3.11.1. Actuation of the light-signalling device control must be followed by illumination of the lamp within a maximum of one second and extinction of the first lamp within a maximum of one and a half seconds. 6.3.11.2.2. the direction indicator lamps on the same side of the vehicle must flash at the same frequency and in phase. 6.3.11.3.2. the direction indicator lamps may flash on the same side of the vehicle either simultaneously or alternately. The front lamps must not be visible to the rear nor the rear lamps to the front within the zones defined in Appendix 1. 6.3.11.4.2. direction indicator lamps on the same side of the vehicle may flash either simultaneously or alternately. The front lamps must not be visible to the rear, nor the rear lamps visible to the front within the zones defined in Appendix 1. 6.3.11.5. In the event of failure, other than a short circuit, of one direction indicator lamp, the other must continue to flash, or remain lit, but the frequency in this state may be different from that specified. 6.4.1. Number: one or two. 6.4.2. Arrangement drawing: no individual specifications. 6.4.3.1. Width: if there is only one stop lamp its centre of reference must lie within the median longitudinal plane of the vehicle, or if there are two stop lamps they must be symmetrical to the median longitudinal plane of the vehicle. 6.4.3.2. Height: minimum 250 mm, maximum 1 500 mm above ground. 6.4.3.3. Length: at the rear of the vehicle. Horizontal angle: 45° to the left and to the right. However, the vertical angle below the horizontal may be reduced to 5° if the lamp is less than 750 mm above the ground. 6.4.5. Alignment: towards the rear of the vehicle. 6.4.6. May be grouped with one or more other rear lamps. 6.4.7. May not be combined with another lamp. 6.4.8. May be reciprocally incorporated with the rear position lamp. 6.4.9. Operational electrical connection: must light up whenever at least one of the service brakes is applied. 6.5.1. Number: one or two. 6.5.2. Arrangement drawing: no individual specifications. 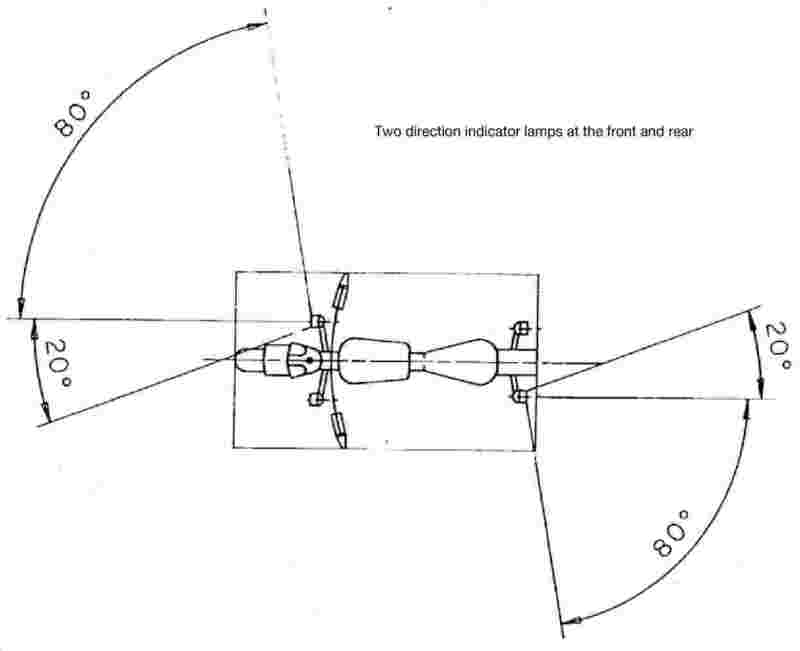 two front position lamps one or both of which is/are reciprocally incorporated with another front lamp must be installed in such a way that their reference centres are symmetrical in relation to the median longitudinal plane of the vehicle. 6.5.3.2. Height: minimum 350 mm, maximum 1 200 mm above the ground. 6.5.3.3. Length: at front of vehicle. Horizontal angle: 80° to the left and to the right if there is a single position lamp; 80° to the outside and 45° towards the inside if there are two position lamps. 6.5.5. Alignment: towards the front. May pivot as a function of the steering angle. 6.5.6. May be grouped with any other front lamp. 6.5.7. May be reciprocally incorporated with any other front lamp. 6.5.8. Operational electrical connections: no individual specifications. 6.6.1. Number: one or two. 6.6.2. Arrangement drawing: no individual specifications. 6.6.3.1. Width: the reference centre must be located within the median longitudinal plane of the vehicle if there is only one position lamp, or if there are two position lamps these must be symmetrical to the median longitudinal plane of the vehicle. 6.6.3.2. Height: minimum 250 mm, maximum 1 500 mm above the ground. 6.6.3.3. Length: at rear of vehicle. Horizontal angle: 80° to the left and to the right if there is a single position lamp; 80° towards the outside and 45° towards the inside if there are two position lamps. 6.6.5. Alignment: towards the rear. 6.6.6. May be grouped with any other rear lamp. 6.6.7. May be reciprocally incorporated with the stop lamp or non-triangular rear retro-reflector, or with both. 6.6.8. Operational electric connections: no individual specification. Its function may be fulfilled by the device provided, where appropriate, for the front position lamp. 6.7.1. Number per side: one or two Class IA (1). 6.7.2. Arrangement drawing: no individual specifications. 6.7.3.1. Width: no individual specifications. 6.7.3.2. Height: 300 mm minimum, 900 mm maximum above the ground. 6.7.3.3. Length: should be such that, under normal conditions, the device cannot be masked by the driver or passenger, nor by their clothing. Horizontal angles: 30° towards the front and rear. However, the vertical angle below the horizontal may be reduced to 5° if the reflector is less than 750 mm above the ground. 6.7.5. Alignment: the reference axis of the retro-reflectors must be perpendicular to the median longitudinal plane of the vehicle and positioned outwards. Retro-reflectors at the front may pivot in line with the steering angle. 6.7.6. May be grouped with other signalling devices. 6.8.1. Number: one Class IA (2). 6.8.2. Arrangement drawing: no individual specifications. 6.8.3.1. Width: the reference centre must be located within the median longitudinal plane of the vehicle. 6.8.3.2. Height: minimum 250 mm, maximum 900 mm above the ground. 6.8.3.3. Length: at rear of vehicle. Horizontal angle: 30° to the left and right. 6.8.5. Alignment: towards the rear. 6.8.6. May be grouped with any other lamp. The illuminating surface of the reflector may have parts in common with any other rear-mounted red lamp. 6.9.1. Each pedal of a two-wheel moped must be fitted with two retro-reflectors. 6.9.2. Arrangement drawing: no individual specification. The illuminating surface of the retro-reflector must be recessed within its frame. The reflectors must be installed within the body of the pedal in such a way that they are clearly visible both to the front and to the rear of the vehicle. The reference axis of the reflectors, the shape of which must be adapted to that of the body of the pedal, and put at right angles to the axis of the pedal. The pedal reflectors need be mounted only on vehicle pedals which, by means of cranks or similar devices, may act as a means of propulsion instead of the engine. They need not be mounted on pedals acting as vehicle controls or solely as footrests for the driver or passenger. 6.10.1. Number: one Class IA (2). 6.10.2. Arrangement drawing: no individual specification. 6.10.3.3. Length: at front of vehicle. 6.10.5. Alignment: towards the front. May pivot in line with the steering angle. 6.10.6. May be grouped with one or more lamps. The lamp may consist of several optical elements intended to illuminate the position of the plate. Such that the lamp illuminates the position reserved for the registration plate. 6.11.6. May be grouped with one or more rear lamps. 6.11.7. May be combined with the rear position lamp. 6.11.8. May not be reciprocally incorporated with any other lamp. 6.11.9. Operational electrical connections: no individual specifications. Its operation must be ensured by the same telltale as provided for the position lamp. (1) In accordance with the classification set out in Directive 76/757/EEC. (2) In accordance with the classification set out in Directive 76/757/EEC. (1) State on a separate sheet for each device the duly identified types of devices meeting the fitting requirements of this Annex. (2) Only for two-wheel mopeds fitted with pedals. (3) Excluding mopeds by an exemption such as provided for under point B(14) of Annex I. 1.7. direction indicator lamps for three-wheel mopeds with closed bodywork. 3. Each of the lighting and light-signalling devices referred to in points 1 and 2 must be fitted in accordance with the appropriate provisions of point 6 below. 5. The lighting and light-signalling devices referred to in points 1 and 2 and type-approved for motorcycles, in accordance with Directive 97/24/EC, or type-approved for vehicles in categories M1 and N1, in accordance with Directives 76/757/EEC, 76/758/EEC, 76/759/EEC, 76/760/EEC, 76/761/EEC, 76/762/EEC, 77/538/EEC or 77/539/EEC, shall also be permitted on three-wheel mopeds and light quadricycles. However, in the case of three-wheel mopeds with a maximum width exceeding 1 300 mm, two main-beam headlamps are required. 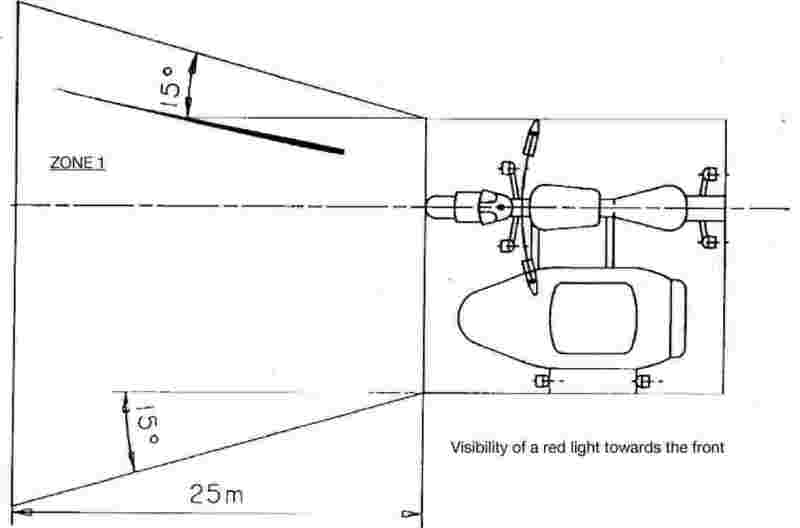 two main-beam headlamps of which either one or both are reciprocally incorporated with another front lamp must be fitted in such a way that their reference centres are symmetrical in relation of the median longitudinal plane of the vehicle. 6.1.3.2. The length: at the front of the vehicle. This requirement is considered to have been met if the light emitted does not disturb the driver either directly or indirectly by means of the rear-view mirrors and/or other reflective surfaces on the vehicle. 6.1.3.3. In the case of a single independent main-beam headlamp, the distance between the edge of the illuminating surface and that of the dipped-beam headlamp must not exceed 200 mm for each pair of lamps. However, in the case of three-wheel mopeds, the maximum width of which exceeds 1 300 mm, two dipped-beam headlamps are required. 6.2.2. Arrangement drawing: no particular specification. the internal edges of the illuminating surfaces must be at least 500 mm apart. This distance may be reduced to 400 mm if the maximum width of the vehicle is less than 1 300 mm. 6.2.3.3. Length: at the front of the vehicle this requirement is considered to have been met if the light emitted does not disturb the driver either directly or indirectly by means of the rear-view mirrors and/or other reflective surfaces of the vehicle. 6.2.6. May be grouped together with the main-headlamp and the front position lamp. 6.2.7. May not be combined with any other lamp. 6.2.8. May be reciprocally incorporated with the main headlamp and the front position lamp. The control for changing to the dipped beam must switch off all main-beam headlamps simultaneously, whereas the dipped beams may remain switched on at the same time as the main beam. 6.3.3.2. Height: minimum 350 mm, maximum 1 500 mm above the ground. This may be optical or auditory or both. If it is optical it must be green and of the flashing type. It must be visible under all normal operating conditions. It must be extinguished or remain alight without flashing or show a marked change of frequency in the event of the malfunction of any of the direction indicator lamps. If it is entirely auditory it must be clearly audible and show the same operating conditions as the optical telltale. 6.3.11.1. Actuation of the light-signalling device control must be followed by illumination of the lamp within a maximum of one second and extinction of the first lamp within a maximum of one-and-a-half seconds. However, for three-wheel mopeds with a maximum width exceeding 1 300 mm, two stop lamps are required. 6.4.3.1. Width: if there is only one stop lamp its centre of reference must lie within the median longitudinal plane of the vehicle, or if there are two stop lamps they must be symmetrical to the median longitudinal plane of the vehicle. In the case of vehicles with two rear wheels: at least 600 mm between the two lamps. The distance may be reduced to 400 mm of the maximum width if the vehicle is less than 1 300 mm. 6.4.7. May not be combined with any other lamp. 6.4.9. Electrical connection: must light up whenever at least one of the service brakes is applied. However, in the case of three-wheel mopeds with a maximum width exceeding 1 300 mm, two front position lamps are required. two front position lamps one or both of them reciprocally incorporated with another front lamp must be installed in such a way that their geometric centres are symmetrical in relation to the median longitudinal plane of the vehicle. the internal edges of the illuminating surfaces must be at least 500 mm apart. That distance may be reduced to 400 mm if the maximum width of the vehicle is less than 1 300 mm. Horizontal angle: 80° to the left and to the right if there is a single position lamp; 80° to the outside and 45° to the inside if there are two position lamps. 6.5.8. Electrical connections: no particular specification. However, for three-wheel mopeds with a maximum width exceeding 1 300 mm, two rear position lamps are required. 6.6.3.1. Width: the reference centre must be located within the median longitudinal plane of the vehicle if there is only one rear position lamp; if there are two rear position lamps these must be symmetrical to the median longitudinal plane of the vehicle. In the case of vehicles with two rear wheels: at least 600 mm between the two lamps. This distance may be reduced to 400 mm if the maximum width of the vehicle is less than 1 300 mm. Horizontal angle: 80° to the left and to the right if there is a single position lamp; 80° towards the outside and 45° towards the inside if there are two rear position lamps. 6.6.8. Electrical connections: no particular specification. 6.7.1. Number: one or two Class IA (1). However, in the case of three-wheel mopeds with a maximum width exceeding 1 000 mm, two non-triangular rear retro-reflectors are required. 6.7.3.1. Width: the reference centre must be located within the median longitudinal plane of the vehicle if there is only one retro-reflector or, if there are two retro-reflectors, they must be symmetrical to the median longitudinal plane of the vehicle. the internal edges of the retro-reflectors must be at least 500 mm apart. This distance may be reduced to 400 mm if the maximum width of the vehicle is less than 1 300 mm. 6.7.3.2. Height: minimum 250 mm, maximum 900 mm above the ground. 6.7.3.3. Length: at rear of vehicle. Horizontal angles: 30° to the left and right. 6.7.5. Alignment: towards the rear. 6.7.6. May be grouped with any other lamp. The illuminating surface of the retro-reflector may have parts in common with any other rear-mounted red lamp. Each pedal of a three-wheel moped must be fitted with two retro-reflectors. 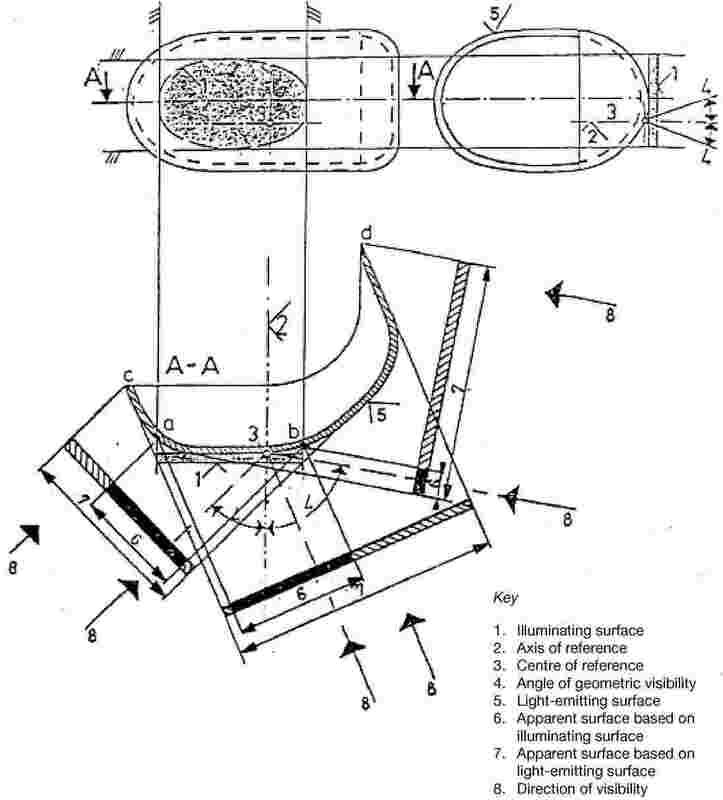 They must be fitted in such a way that the operational surfaces are external to the pedal itself, and perpendicular to the bearing plane of the pedal, with their optical axis parallel to the median longitudinal plane of the vehicle. 6.8.1. Number: four retro-reflectors or groups of retro-reflectors. The illuminating surface of the retro-reflector must be recessed within its frame. The reflectors must be installed within the body of the pedal in such a way that they are clearly visible both to the front and to the rear of the vehicle. The reference axis of the reflectors, the shape of which must be adapted to that of the body of the pedal, must be put at right angles to the axis of the pedal. The pedal reflectors must be mounted only on vehicle pedals which, by means of cranks or similar devices, may act as a means of propulsion instead of the engine. They must not be mounted on pedals acting as vehicle controls or solely as footrests for the driver or passenger. 6.9.1. Number per side: one or two Class IA (2). 6.9.2. Arrangements drawing: no individual specifications. 6.9.3.1. Width: no individual specifications. 6.9.3.2. Height: minimum 300 mm, maximum 900 mm above the ground. 6.9.3.3. Length: must be such that, under normal conditions, the device cannot be hidden by the driver or passenger, or by their clothing. Horizontal angles: 30° towards the front and back. 6.9.5. Alignment: the reference axis of the retro-reflectors must be perpendicular to the median longitudinal plane of the vehicle and positioned outwards. Retro-reflectors at the front move in line with the steering angle. 6.9.6. May be grouped with other signalling devices. 6.10.6. May be grouped with one or more rear lamps. 6.10.7. May be combined with the rear position lamp. 6.10.8. May not be reciprocally incorporated with any other lamp. 6.10.9. Operational electrical connections: no individual specifications. 6.11.1. Provisions identical to those set out in points 6.7.1 to 6.7.11 of Annex VI. 6.12.1. Provisions identical to those set out in points 6.8.1 to 6.8.11 of Annex VI. 6.13.1. Provisions identical to those set out in points 6.9.1 to 6.9.10 of Annex VI. 6.14.1. Provisions identical to those set out in points 6.10.1 to 6.10.4 of Annex VI. 3. Each of the lighting and light-signalling devices referred to in points 1 and 2 must be fitted in line with the appropriate provisions of point 6. 5. The lighting and light-signalling devices referred to in points 1 and 2 and type-approved for vehicles in categories M1 and N1, in accordance with Directives 76/757/EEC, 76/758/EEC, 76/759/EEC, 76/760/EEC, 76/761/EEC, 76/762/EEC, 77/538/EEC or 77/539/EEC, shall also be permitted on motorcycles. 6.1.3.4. In the case of two main-beam headlamps: the distance separating the illuminating surfaces of two main-beam headlamps must not exceed 200 mm. 6.1.6. May be grouped together with the dipped-beam headlamp and the other front lamps. 6.1.8.3. with the front fog lamp. 6.1.11. Other requirements: the maximum intensity of the main-beam headlamps which may be lit at the same time must not exceed 225 000 cd (EC component type-approval value). 6.2.2. Arrangement drawing: no particular specifications. 6.2.3.3. Length: at the front of the vehicle. This requirement is considered to have been met if the light emitted does not disturb the driver either directly or indirectly by means of the rear-view mirrors and/or other reflective surfaces of the vehicle. The vertical inclination of the dipped beam must remain between –0,5 and –2,5 %, except in the case where an external adjusting device is present. 6.2.6. May be grouped together with the main-headlamp and the other front lamps. 6.2.8. May be reciprocally incorporated with the main-beam headlamp and the other front lamps. The control for changing to the dipped beam must switch off all main-beam headlamps simultaneously, whereas the dipped beam may remain switched on at the same time as the main beam. 6.3.3.1.2. The distance between the inner edges of the illuminating surfaces of the rear indicator lamps must be at least 180 mm, subject to compliance with the requirements of point A(10) of Annex I, even when the registration plate is fitted. 6.3.8. May not be reciprocally incorporated with any other lamp. This may be optical or auditory or both. If it is optical it must be a green flashing light and visible under all normal operating conditions. It must be extinguished or remain alight without flashing or show a marked change of frequency in the event of the malfunction of any of the direction indicator lamps. If it is entirely auditory it must be clearly audible and show the same operating conditions as the optical telltale. 6.3.11.1. Actuation of the light-signalling device control must be followed by illumination of the lamp within a maximum of one second and initial extinction of the lamp within a maximum of one and a half seconds. 6.4.9. Electrical connections: must light up whenever at least one of the service brakes is applied. two front position lamps, one or both of them reciprocally incorporated with another front lamp must be installed in such a way that their reference centres are symmetrical in relation to the median longitudinal plane of the vehicle. 6.5.8. Electrical connections: no individual specifications. Non-flashing green indicator light; this telltale is not required if the instrument panel lighting can only be switched on or off together with the position lamp. 6.6.3.1. Width: the reference centre must be located within the median longitudinal plane of the vehicle if there is only one position lamp or, if there are two position lamps, these must be symmetrical to the median longitudinal plane of the vehicle. Horizontal angle: 80° to the left and to the right if there is a single position lamp; 80° towards the outside and 45° to the inside if there are two-position lamps. 6.6.7. May be combined with the rear registration-plate lamp. 6.6.8. May be reciprocally incorporated with the stop lamp or non-triangular rear retro-reflector, or with both, or with the rear fog lamp. 6.6.9. Electrical connections: no individual specifications. 6.7.1. Number: one or two. 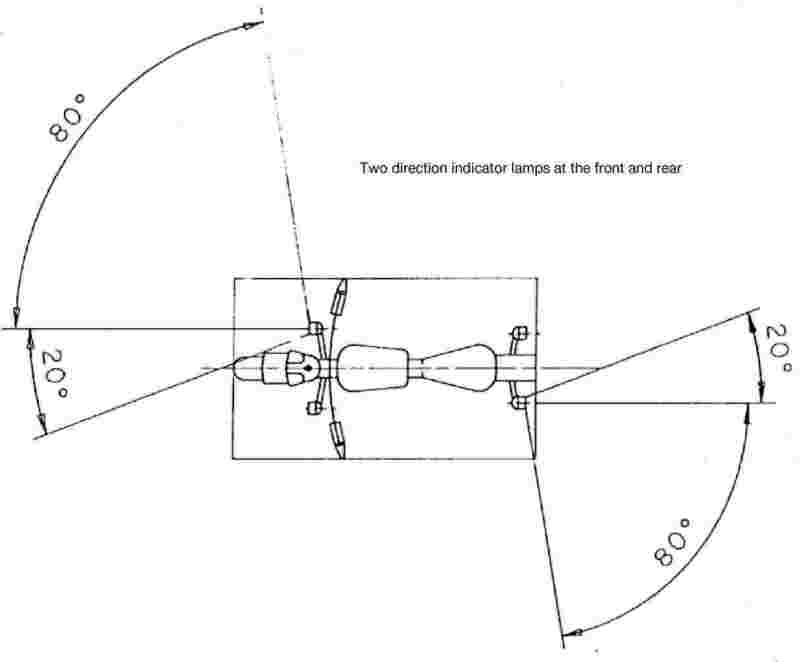 two front fog lamps, one or both of them reciprocally incorporated with another front lamp, must be installed in such a way that their reference centres are symmetrical in relation of the median longitudinal plane of the vehicle. 6.7.3.2. Height: 250 mm minimum above the ground. No point of the illuminating surface may be above the highest point of the illuminating surface of the dipped-beam headlamp. 6.7.3.3. Length: at the front of the vehicle. This requirement is considered to have been met if the light emitted does not disturb the driver, either directly or indirectly by means of the rear-view mirrors and/or other reflective surfaces of the vehicle. 45° to the left and to the right in the case of a non-central lamp, in which case the internal angle must be β = 10°. 6.7.5. Alignment: towards the front. 6.7.6. May be grouped with the other front lamps. 6.7.7. May not be combined with any other front lamp. 6.7.8. May be reciprocally incorporated with a main-beam headlamp and a front position lamp. It must be possible to switch the front fog lamp on or off independently of the main-beam headlamp or the dipped-beam lamp. 6.8.1. Number: one or two. 6.8.3.1. 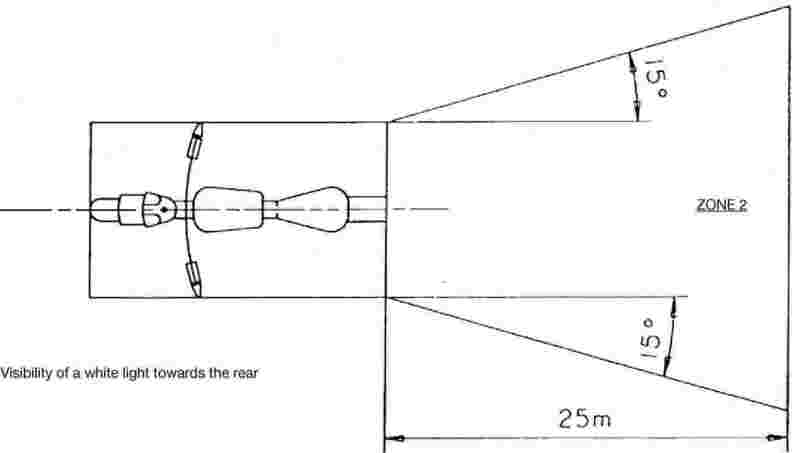 Width: one independent rear fog lamp may be fitted above, below or next to another rear lamp; its reference centre must be situated in the median longitudinal plane of the vehicle if the lamps are on top of each other; if the lamps are next to each other, their reference centres must be symmetrical in the relation to the median longitudinal plane of the vehicle. A rear fog lamp reciprocally incorporated with another rear lamp must be installed in such a way that its reference centre is situated in the median longitudinal plane of the vehicles. 6.8.3.3. Length: at the rear of the vehicle. 6.8.3.4. The distance between the illuminating surface of the rear fog lamp and that of the stop lamp must be at least 100 mm. 25° to the left and to the right. 6.8.6. May be grouped with any other rear lamp. 6.8.7. May not be combined with any other lamp. 6.8.8. May be reciprocally incorporated with a rear position lamp. The lamp may not be alight unless one or more of the following lamps are lit: the main-beam headlamp, the dipped-beam headlamp or the front fog lamp. If there is a front fog lamp, it must be possible to switch the rear fog lamp off independently of the front fog lamp. 6.9.1. Requirements identical to those set out in points 6.3 to 6.3.8. The signal must be actuated by a separate control which enables all of the direction indicators to be supplied with current simultaneously. A red flashing light or, if there is not a separate telltale, the simultaneous operation of the telltales specified in point 6.3.10. A light flashing at the frequency of 90 ± 30 times per minute. Actuation of the light-signalling device must be followed by illumination of the lamp within a maximum of one second and initial extinction of the lamp within a maximum of one and a half seconds. It must be possible to actuate the hazard warning signal even if the device for switching the engine on or off is in a position such that it is impossible for the latter to operate. 6.11.1. Number per side: one or two Class IA (1). 6.11.2. Arrangement drawing: no individual specifications. 6.11.3.1. Width: no individual specifications. 6.11.3.2. Height: 300 mm minimum, 900 mm maximum above the ground. 6.11.3.3. Length: must be such that, under normal conditions, the device cannot be masked by the driver or the passenger, nor by their clothing. However, the vertical angle below the horizontal may be reduced to 5° if the height of the retro-reflector is less than 750 mm. 6.11.5. Alignment: the reference axis of the retro-reflectors must be perpendicular to the median longitudinal plane of the vehicle and positioned outwards. Retro-reflectors at the front may move in line with the steering angle. 6.11.6. May be grouped with the other signalling devices. 6.12.1. Number: one Class IA (1). 6.12.2. Arrangement drawing: no individual specifications. 6.12.3.1. Width: the reference centre must be situated in the median longitudinal plane of the vehicle. 6.12.3.2. Height: minimum 250 mm, maximum 900 mm above the ground. 6.12.3.3. Length: to the rear of the vehicle. Horizontal angle: 30° to the left and to the right. 6.12.5. Alignment: towards the rear. 6.12.6. May be grouped with any other lamp. 6.12.7. The illuminating surface of the retro-reflector may have parts in common with any other red rear lamp. 3. Each of the lighting and light-signalling devices referred to in points 1 and 2 must be fitted in accordance with the appropriate provisions of point 6. 5. The lighting and light-signalling devices referred to in points 1 and 2 and type-approved for vehicles in categories M1 and N1, in accordance with Directives 76/757/EEC, 76/758/EEC, 76/759/EEC, 76/760/EEC, 76/761/EEC, 76/762/EEC, 77/538/EEC or 77/539/EEC, shall also be permitted on motorcycles with sidecar. 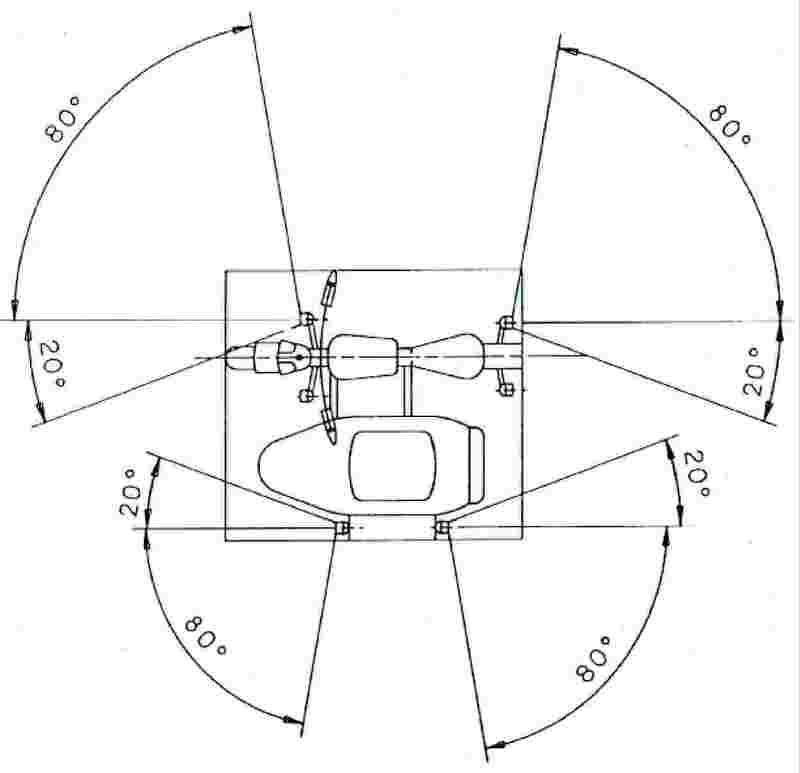 two main-beam headlamps of which either one or both are reciprocally incorporated with another front lamp must be fitted in such a way that their reference centres are symmetrical in relation of the median longitudinal plane of the motorcycle. The main-beam headlamps must switch on simultaneously. When switching from the dipped to the main-beam all of the main-beam headlamps must be lit. When switching from the main beam to the dipped-beams all of the main-beam headlamps must be switched off simultaneously. The dipped-beam headlamps may remain lit at the same time as the main-beam headlamps. 6.1.11. Other requirements: the maximum intensity of the main-beam headlamps which can be switched on at the same time must not exceed 225 000 cd (EC component type-approval value). 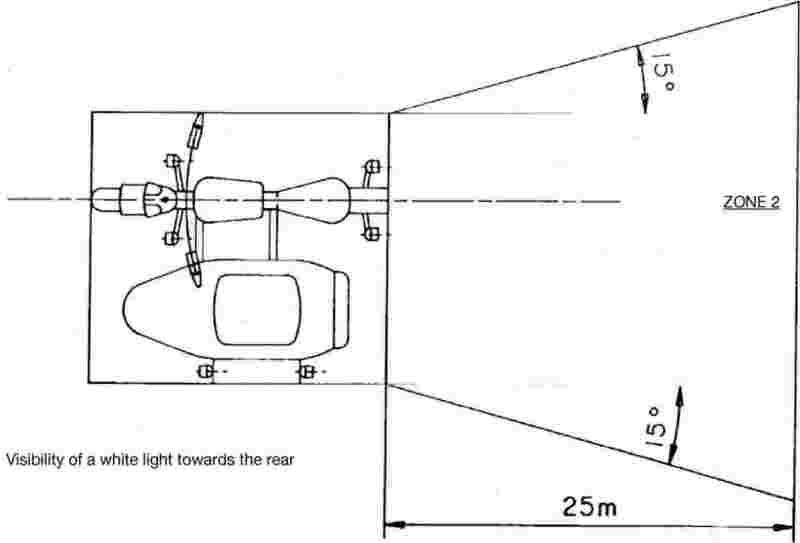 two dipped-beam headlamps, of which either one or both are reciprocally incorporated with another front lamp, must be installed in such a way that their reference centres are symmetrical in relation to the median longitudinal plane of the motorcycle. The vertical inclination of the dipped beam must remain between –0,5 % and –2,5 %, except in the case where an external adjusting device is present. 6.2.8. May be reciprocally incorporated with the main headlamp and the other front lamps. The control for changing to the dipped-beam must switch off all main-beam headlamps simultaneously, whereas the dipped-beams may remain switched on at the same time as the main beam. 6.3.3.2. Length: the distance towards the front between the transverse plane corresponding to the extreme longitudinal rearmost extremity of the vehicle and the centre of reference of the rear indicators must not exceed 300 mm. The front direction indicator on the side-car must be ahead of the centre axis of the side-car and the rear direction indicator must be to the rear of the centre axis of the side-car. 6.4.1. Number: two or three (only one of which on the side-car). 6.4.3.1. Width: the lateral distance between the outermost edge of the illuminating surfaces of the outermost stop lamps and the overall width must not exceed 400 mm. Where a third stop lamp is fitted it must be symmetrical to the stop lamp that is not fitted to the side-car in relation to the median longitudinal plane of the motorcycle. Horizontal angle: 45° to the left and to the right. Where a stop lamp is fitted to the side-car: 45° to the outside and 10° to the inside. 6.5.1. Number: two or three (one only on the side-car). 6.5.3.1. Width: the lateral distance between the outermost edge of the illuminating surfaces of the outermost two front position lamps and the outermost edges of the vehicle must not exceed 400 mm. Where a third front position lamp is fitted it must be symmetrical to the front position lamp other than that fitted to the side-car, in relation to the median longitudinal plane of the motorcycle. Horizontal angle: 80° to the outside and 45° to the inside. Non-flashing green pilot light; this telltale is not required where the dashboard lighting can only be switched on and off simultaneously with the position lamp. 6.6.1. Number: two or three (one only on the side-car). 6.6.3.1. Width: the lateral distance between the outermost edge of the illuminating surfaces of the outermost rear position lamps and the outermost edges of the vehicle must not exceed 400 mm. Where a third rear position lamp is fitted it must be symmetrical to the front position lamp other than that fitted to the side-car, in relation to the median longitudinal plane of the motorcycle. two front fog lamps, one or both of them, reciprocally incorporated with another front lamp, must be installed in such a way that their reference centres are symmetrical in relation to the median longitudinal plane of the vehicle. 6.7.3.2. Height: 250 mm minimum above the ground. No point of the illuminating surface must be above the highest point of the illuminating surface of the dipped-beam headlamp. 45° to the outside and 10° towards the inside. It must be possible to switch the front fog lamp on or off independently of the main-beam headlamp or the dipped-beam headlamp. 6.8.3.1. Width: when a single rear fog lamp is fitted its position in relation to the median longitudinal plane of the vehicle must be on the side opposite that required for the rule of the road in the Member State where it is to be registered. The lamp may not be lit unless one or more of the following lamps are lit: the main-beam headlamp, the dipped-beam headlamp or the front fog lamp. If there is a front fog lamp, it must be possible to switch off the rear fog lamp independently of the front fog lamp. A light flashing at the frequency of 90 ± 30 times per minute. Actuation of the light-signalling device must be followed by illumination of the lamp within a maximum of one second and initial extinction of the lamp within a maximum of one-and-a-half seconds. 6.10.9. Electrical connections: no individual specifications. the inner edges of the reflectors must be at least 500 mm apart. That distance may be reduced to 400 mm if the maximum width of the vehicle is less than 1 300 mm. Horizontal angle: 30° to the outside and 10° to the inside. (1) State on a separate sheet for each device the duly identified types of device meeting the fitting requirements of this Annex. 5. The lighting and light-signalling devices referred to in points 1 and 2 and type-approved for vehicles in categories M1 and N1, in accordance with Directives 76/757/EEC, 76/758/EEC, 76/759/EEC, 76/760/EEC, 76/761/EEC, 76/762/EEC, 77/538/EEC or 77/539/EEC, shall also be permitted on tricycles. However, for tricycles with a maximum width exceeding 1 300 mm, two main-beam headlamps are required. The main-beam headlamps must switch on simultaneously. When switching from the dipped to the main beam all of the main-beam headlamps must be lit. When switching from the main beam to the dipped beams all of the main-beam headlamps must be switched off simultaneously. The dipped-beam headlamps may remain lit at the same time as the main-beam headlamps. However, for tricycles with a maximum width exceeding 1 300 mm two dipped-beam headlamps are required. 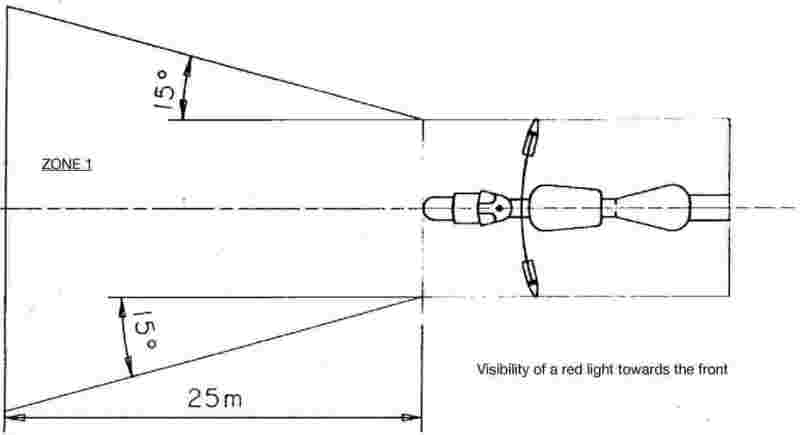 two dipped-beam headlamps, of which either one or both are reciprocally incorporated with another front lamp, must be installed in such a way that their reference centres are symmetrical in relation to the median longitudinal plane of the vehicle. the innermost edges of the illuminating surfaces must be at least 500 mm apart. This distance may be reduced to 400 mm if the maximum width of the vehicle is less than 1 300 mm. One side direction indicator is also permitted per side. 6.3.3.2. Height: a minimum of 350 mm and a maximum of 1 500 mm above the ground. This may be optical or auditory or both. If it is optical it must be a green flashing light and visible under all normal operating conditions. It must be extinguished or remain alight without flashing or show a marked change of frequency in the event of the malfunction of any of the direction indicator lamps. If it is entirely auditory it must be clearly audible and show a marked change of frequency in the event of any malfunction. 6.3.11.5. In the event of failure, other than a short circuit, of one direction indicator lamp, the other must continue to flash, or remain lit, but the frequency in this state may be different from that specified, unless the vehicle is fitted with a telltale. However, for tricycles with a maximum width exceeding 1 300 mm, two stop lamps are required. In the case of vehicles with two rear wheels: at least 600 mm between the two lamps. The distance may be reduced to 400 mm of the maximum width if the vehicle is less than 1 300 mm. However, in the case of tricycles with a maximum width exceeding 1 300 mm, two front position lamps are required. 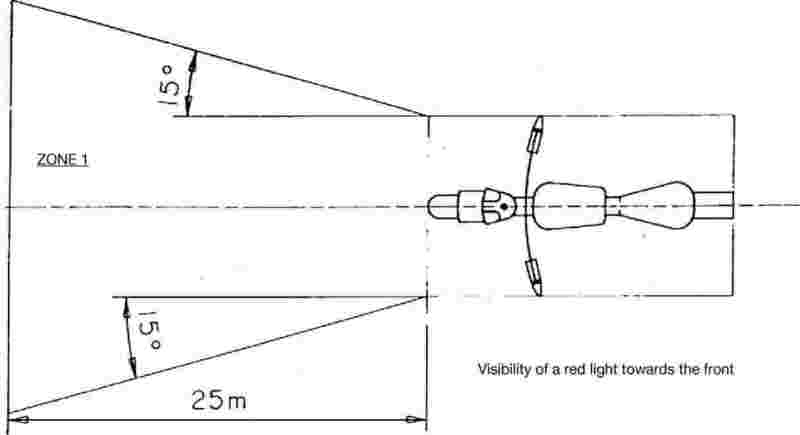 two front position lamps, of which one or both are combined with another front lamp, must be installed in such a way that their reference centres are symmetrical in relation to the median longitudinal plane of the vehicle. Horizontal angle: 80° to the left and right if there is a single position lamp; 80° to the outside and 45° to the inside, if there are two position lamps. However, for tricycles with a maximum width exceeding 1 300 mm, two rear position lamps are required. 6.6.3.1. Width: the reference centre must be located within the median longitudinal plane of the vehicle, if there is only one position lamp or, if there are two position lamps, they must be symmetrical to the median longitudinal plane of the vehicle. In the case of vehicles with two rear wheels these must be at least 600 mm apart. This distance must be reduced to 400 mm if the maximum width of the vehicle is less than 1 300 mm. the edges of the illuminating surface furthermost from the median longitudinal plane of the vehicle must not be further than 400 mm from the outermost edge of the vehicle. 6.8.3.1. Width: the reference centre must be situated in the median longitudinal plane of the vehicle if there is a single rear fog lamp or, if there are two fog lamps, they must be symmetrical in relation to the median longitudinal plane of the vehicle. In the case of vehicles with two rear wheels: at least 600 mm between the two lamps. This distance may be reduced to 400 mm if the maximum width of the vehicle is less than 1 300 mm. 6.8.3.2. Height: minimum 250 mm, maximum 1 000 mm above the ground. 6.8.3.3. Length: at the rear of the vehicle. If there is a single rear fog lamp, it must be on the side of the median longitudinal plane of the vehicle opposite the normal direction of travel; the reference centre may also be situated on the longitudinal plane of symmetry of the vehicle. 6.9.1. Number: one or two. 6.9.2. Arrangement drawing: no individual specifications. 6.9.3.2. Height: minimum 250 mm, maximum 1 200 mm above the ground. 6.9.3.3. Length: at the rear of the vehicle. 45° outwards and 30° inwards if there are two reversing lamps. 6.9.5. Alignment: towards the rear. 6.9.6. May be grouped with any other rear lamp. 6.9.7. May not be combined with any other lamp. 6.9.8. May not be reciprocally incorporated with another lamp. The reversing lamp may not be alight unless the reverse gear is engaged and the device for switching off the engine is in a position such that it is possible for the engine to operate. It must not be possible for the lamp to be alight or remain lit if one of these conditions is unverified. 6.10.1. Requirements identical to those set out in points 6.3 to 6.3.8. A red flashing light or, if there is no separate telltale, the simultaneous operation of the telltales specified in point 6.3.10. A light flashing at a frequency of 90 ± 30 times per minute. Actuation of the light-signalling device must be followed by illumination of the lamp within a maximum of one second and initial extinction of the lamp within a maximum of one and a half seconds. It must be possible to actuate the hazard warning signal even if the device for switching the engine on or off is in a position such that it is impossible for the later to operate. 6.11.9. Electrical connections: no individual specifications. 6.12.1. Number: one or two Class IA (1). However, in the case of tricycles with a maximum width exceeding 1 000 mm, two non-triangular rear reflectors are required. 6.12.3.1. Width: the reference centre must be situated in the median longitudinal plane of the vehicle if there is a single retro-reflector or, if there are two retro-reflectors, they must be symmetrical to the median longitudinal plane of the vehicle. In the case of a vehicle with two rear retro-reflectors, the edges of the illuminating surface furthest from the median longitudinal plane of the vehicle must not be more than 400 mm from the outermost part of the vehicle. The internal edges of the retro-reflectors must be at least 500 mm apart. This distance may be reduced to 400 mm if the maximum width of the vehicle is less than 1 300 mm. 6.12.3.2. Height: 250 mm minimum, 900 mm maximum above the ground. 6.12.3.3. Length: at the rear of the vehicle. The illuminating surface of the retro-reflector may have parts in common with any other red rear lamp situated at the rear. 6.13.1. Number per side: one or two Class IA (1). 6.13.2. Arrangement drawing: no individual specifications. 6.13.3.1. Width: no individual specifications. 6.13.3.2. Height: 300 mm minimum, 900 mm maximum above the ground. 6.13.3.3. Length: must be such that, under normal conditions, the device cannot be hidden by the driver or passenger, or by their clothing; masked by the driver or the passenger, nor by their clothing. 6.13.5. Alignment: the reference axis of the retro-reflectors must be perpendicular to the median longitudinal plane of the vehicle and positioned outwards. Retro-reflectors at the front may move in line with the steering angle. 6.13.6. May be grouped with the other signalling devices. if the installation of the lighting and light-signalling devices complies with the requirements of Directive 93/92/EEC, as amended by this Directive.